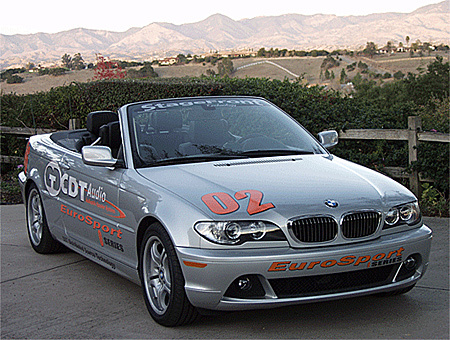 CDT Audio One Of A Kind BMW 330i Convertible Install. Superior sound in an automotive environment often considered nearly impossible to achieve. Call or E-mail CDT Audio for more information. Dead spots are eliminated in a manner analogous to accent lighting so no portion of the performance falls in shadow. Even illumination creates a full and precise sonic tapestry. Stage-Front speakers mounted in the kick panels take first base in the game to make a total image with ultimate quality. These are midrange drivers. Center-Stage speakers in a unique Lizard-like dash-mounted speaker system make a very significant contribution to the evenness of the image. This unique stereo system provides images of equal quality and orientation to both driver and passenger. Most impressive continuity is achieved in the front image. This is a mid-Tweeter setup. 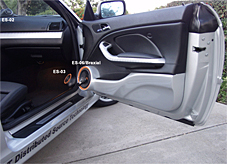 Upstage speakers are used in conjunction with the windshield glass to finally raise the image and provide the extreme top-end from an elevated source. These super Tweeters are gradually blended-in by an upstage module. Since this entire array is driven by subtle amounts of power it can, with the dedicated CDT Audio installation modules, be driven by the same two channels that supply the main front door speakers. Since most of this subtle accent addition is applied in the midrange frequencies and above to the highest audible frequencies a tonal balance must be restored. Custom filtering gradually applies a 6db boost to the front channels below 200Hz to restore balance and the combination thus understates to some extent frequencies in the 200Hz to 800Hz region, which are over emphasized by door mounting the mid-bass speakers. This essentially “Zone adapts” the system without separately equalizing the door speakers. Unique subwoofer system is employed This exemplary front system hands the final job of low bass to a massive pair of CDT Audio SQ Series ten-inch subwoofers. 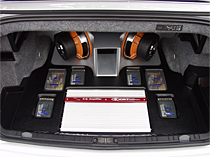 Utilizing the ski channel in the OEM car provides a clear avenue for bass. No sealed or ported enclosures are used and very little trunk area is occupied. 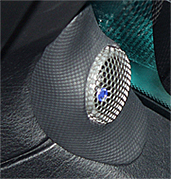 The woofers are mounted in a “V” configuration in an open interface mounting system that communicates with both the trunk and the front of the car. A clear but narrowed opening is maintained in the location of the original ski channel. The subs are essentially mounted in a step-wise tapered port with a larger opening into the passenger area. The entire trunk volume is used as a ported box. This essentially mounts the woofers free-air with very low resistance to movement except at the port frequency. Powerful woofers and such a large volume can only create a very dipped-down response shape. Furthermore the high compliance low Qt woofers have nothing to control subsonic movement. Terrible response with heavy bottoming and poor power handling should result. CDT Audio SQA-4140 Amplifier This myopic vision is under-endowed with regard to seeing the possibilities available with this set-up when using active filtering supplied in this case by the CDT Audio SQA-4140 four-channel amplifier. Since the SQA-4140 employs 24/dB octave continuously adjustable active filters this response can be turned from a sows ear into a silk purse. The 24dB high pass set at 40Hz begins rolling off the bass rapidly at the same time as it restores a smooth response shape. This places the resonant subsonic energy 24dB down at the resonance of the subwoofer pair. Less than 1% of that subsonic bass power is wasted and the subs are virtually insured against bottoming. This is a win-win combination.